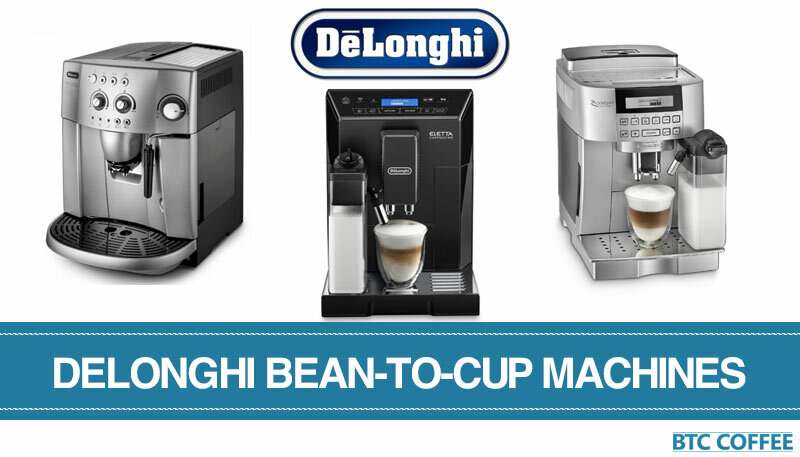 Delonghi is probably the most popular manufacturer of bean-to-cup coffee machines in the UK. With a variety of models suiting many budgets, tastes and personal requirements, there's almost certainly a Delonghi bean-to-cup coffee machine that matches your needs. But which are the best Delonghi machines? And which coffee maker provides the greatest value for money? Keep reading to find out. Known for their high-quality products with a focus on design, Delonghi are amongst the most popular home appliance manufacturers. The company is based in Italy and, aside from coffee machines, produces gelato makers, air conditioners and many other products. Delonghi tends to focus on mid-range coffee machines costing between £200-£800 - although they have some premium models too (such as the Prima Donna range). While this might sound expensive, the priciest bean-to-cup models can cost £1500+, so Delonghi machines often provide excellent value for money. They also offer slightly less expensive options such as the ESAM2800. There are many Delonghi bean-to-cup machines on the market, but we've summarised our five favourite below. It's rare for Delonghi to produce a poor-quality coffee machine - we just think these five are the best of the best. 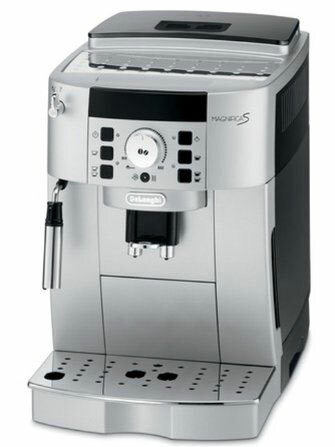 The Delonghi ESAM4000.b is one of our top rated coffee machines. It also made our list of the top 10 best bean-to-cup coffee machines. But what makes it such a special model? The first thing is the price. It's on the low-end of the bean-to-cup scale, with an RRP of less than £300. If you're on a tight budget but still want fresh espresso, it's one of the best options. It's also a simple machine to use. Despite having a range of coffee customisation options, the control panel is intuitive and straightforward. One thing to note is that the ESAM 4000.b doesn't come with an automatic milk frother. Instead, it includes a steel milk frothing arm. This isn't a surprise though, as only more expensive machines have automatic cappuccino makers, and the frothing arm does a great job. If you're set on getting an automatic cappuccino maker, however, then the Delonghi Eletta ECAM44.660.B is an excellent alternative. It's more expensive, but can produce a cappuccino from start to finish. The ESAM 4000.b is a stylish black coffee machine that can use both ground coffee and fresh beans. Beans are ground using a burr grinder and you can adjust grinding coarseness depending on your requirements. The dual output nozzle allows you to produce two espressos at the same time, and the frothing arm can be used to make latte, latte macchiato and cappuccino. The control panel is easy to use. Ground coffee and water can be loaded at the front of the model, which makes refilling and cleaning much easier. The water tank is 1.8 litres - large enough that you won't need to constantly refill. Inside the machine, the coffee is produced with a 15-bar pump. This is ideal for extracting taste without too much bitterness. A thermoblock is used to heat the water. This speeds up the espresso-making process and reduces wasted energy. Aside from the removable water tank, there are a number of other maintenance features. The machine automatically rinses itself when you turn it on or off, and the brewing unit can be removed for cleaning. The Delonghi ESAM 4000.b is one of the best entry-level bean-to-cup coffee machines available at the moment. It's a stylish model - it certainly doesn't look "budget" - and can produce fantastic espresso. 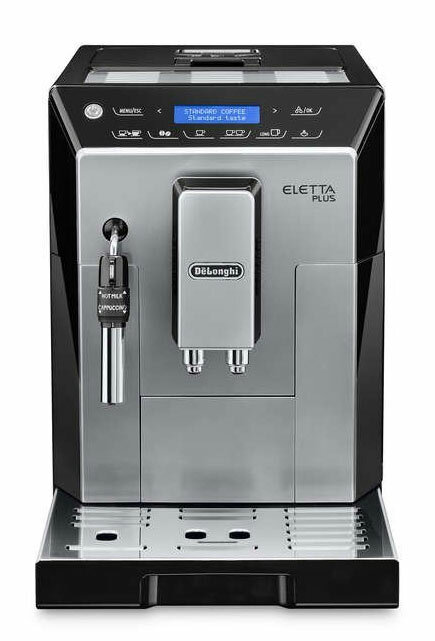 The Eletta ECAM44.660.B is another of our top 10 bean-to-cup coffee machines. It's also proven to be a popular model amongst buyers, with many high ratings on review sites. The ECAM44.660.B is a mid-range/premium model with an RRP of £829.99 (it's often available for less than this on shopping sites though). This makes it considerably more expensive than entry-level Delonghi bean-to-cup coffee machines. But what makes it worth the extra money? The most obvious answer is that it can produce automatic caffe latte and cappuccino due to its milk frother. This is much more consistent than a manual steam arm for frothing milk. It's also capable of making strong and aromatic espresso with the touch of a button. If you have the budget, it's one of the best bean-to-cup coffee machines available at the moment. For an in-depth look at this model, check out our full review. Delonghi have labelled the ECAM44.660.B as a cappuccino maker, so let's start with this function. The machine is able to produce frothy milk automatically using the supplied carafe. When finished, you can simply detach it and put it in the fridge for next time. Beans are ground using the long-life burr grinder. The grinder has 13 different settings for coarseness, providing greater control over the coffee output. Like other bean-to-cup machines, the model grinds fresh beans every time you use it.​ There is also the option to use ground coffee for decaf or if you run out of beans. Another useful feature is the memory function. Once you've found your favourite combination of milk and coffee settings, you can save it for next time. This speeds up the coffee making process even further and ensures you'll always get a great cup of coffee. You can also save multiple profiles for different family members. Other features include a variety of froth settings, an option to choose coffee temperature, coffee strength setting and an automatic shut of mode. The model also has an energy saving standby function and a 2.0 litre water tank. Cleaning a bean-to-cup coffee machine can be a long process, so Delonghi have included a variety of maintenance features. These include automatic programmes for rinsing and decalcification to make sure your coffee machine is always in top condition. If you love cappuccinos as well as espressos, the Delonghi ECAM44.660.B is one of the best options on the market at the moment. It has a variety of useful features to make getting your perfect coffee easy - and, most importantly, produces excellent espresso and cappuccino. The ECAM44.660.B is highly recommended. Note: A cheaper option for cappuccinos is the Delonghi Ecam 23.460. It's​ not quite as advanced, but still makes great coffee. The Delonghi Eletta ECAM 44.620 is another excellent model in the Eletta range. It has stylish design, milk frothing arm and two-output nozzle - and it's also proven to be a popular coffee machine. While it didn't quite make our top 10 list, it's still an excellent bean-to-cup coffee maker. With a cheaper RRP than the ECAM44.660.B, it's a great option if you want tasty and aromatic espresso without paying for an automatic cappuccino maker. The downside is that frothing milk with the steam arm can take some practice to get right. Despite this, the ECAM 44.620 can make excellent espresso, cappuccino, flat white and latte. So if you don't mind using a manual steam arm, it provides great value for money. The first thing you notice about the ​ECAM 44.620 is that it has a stylish and attractive design. We prefer the silver colouring compared to fully black machines (although this is a minor point), and the model will look great in almost any kitchen. There are froth settings for getting your ideal latte or cappuccino​ and also an auto-clean function. The arm can also be used for hot water if you just want a cup of tea. Water is heated using an advanced thermoblock boiler. This heats up water quickly and only uses the water you need. The machine also comes with a 15-bar pump and can brew one or two cups at a time. Other features include a burr grinder with 13 coarseness settings, a decalcification program and a touch display. The model also has energy saving functions and comes with a 2 year guarantee. The Delonghi ECAM 44.620 is effectively the little-brother of the 44.660B. It comes with many of the same features, including memory function, two-nozzle output and variety of customisation settings. In fact, the only major difference is that the model can't produce cappuccinos automatically. If this isn't a problem for you, then it's an excellent choice. 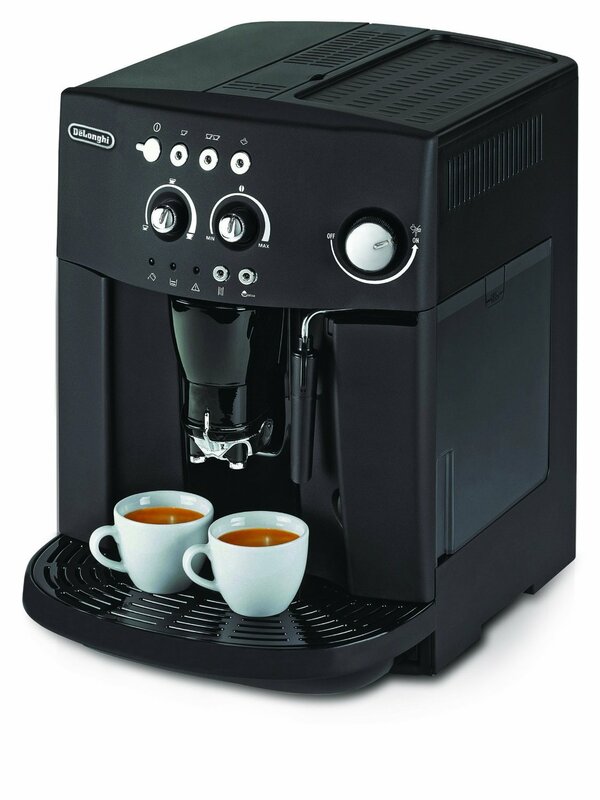 Another ECAM model in our top 5 list of the best Delonghi bean-to-cup coffee machines is the 22.110.SB. It doesn't include an automatic milk frother, but comes with a steam arm for producing rich and creamy milk for cappuccinos and lattes. The ECAM22.110.B is an attractive model with the Italian-style design many people enjoy. It comes with many of the same features as more expensive Delonghi coffee machines, yet is firmly a mid-range model, making it an attractive option to people who want great espresso and cappuccino but can't afford the pricier options. Like most bean-to-cup coffee machines, the ECAM22.110.B can be used with either ground coffee or fresh beans. This is a useful option if you enjoy the occasional cup of decaf or just want to try some new blends. The bean container also comes with a cap for saving the aroma. The ECAM22.110.B is designed to provide you with tasty espresso as quickly as possible. It has a variety of settings to achieve this, including coffee intensity, length and temperature (low, medium or hot). The burr grinder also has 13 settings for bean coarseness, allowing you to customise the taste even further. We mentioned in our review that the control panel can appear intimidating at first glance, but fortunately it's easy to use after a few tries. The icons tell you what options are selected, while the dial allows you to adjust the strength of the coffee to your liking. There are also buttons for swapping between one or two cups of coffee. The steam arm does a great job of milk frothing, although it takes some practice to get close to barista-style results. Even so, the cappuccinos taste great. Other features of the Delonghi ECAM22.110.B bean-to-cup coffee machine include a removable brewing unit, to make cleaning easier, and an automatic rinse mode. There is also a programme for decalcification. If you're looking for a mid-range Delonghi bean-to-cup coffee machine, the ECAM22.110.B is one of the best on the market. It's an attractive model with a range of customisation features, easy-to-clean design and a 2-year warranty. Most importantly, it produces fantastic espresso. The Delonghi PrimaDonna Elite is designed to bring bean-to-cup coffee making into the 21st century. 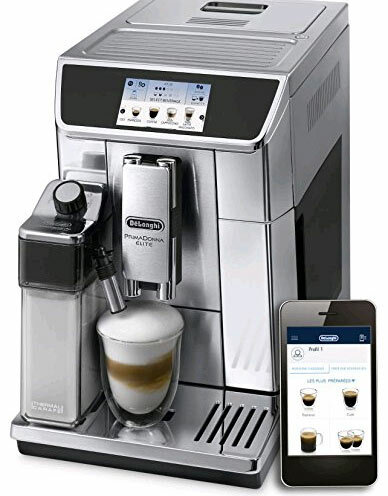 With a range of interesting features, including integration with an Android app, this is one of the most advanced bean-to-cup models (at least for the consumer market). As you might expect, this means the PrimaDonna is also one of the most expensive in the Delonghi range. With a price of up to £1500, depending on the store and whether there are any deals available, this is a machine for the coffee enthusiast with a large budget. If you're looking for one of the best bean-to-cup machines and can afford high price tag, the PrimaDonna is an excellent option. 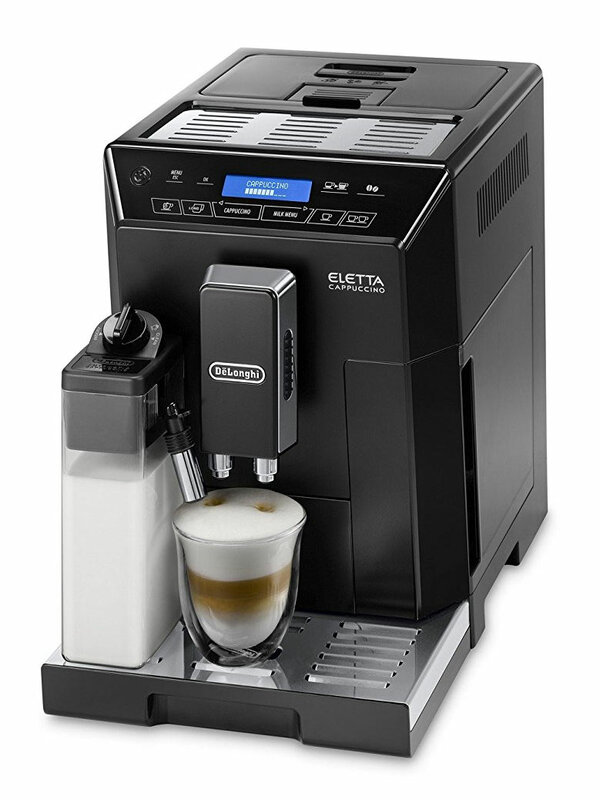 For automatic espresso and cappuccino making at a more reasonable price, however, then you might want to look at the Eletta ECAM44.660.b. ​Let's start with the design. The PrimaDonna Elite is certainly not a machine that "hides" in the kitchen. It's a large model with a big screen (one of the biggest we've seen), so it is likely to catch the eye. Fortunately, it's still an attractive model, with a chrome exterior and familiar coffee output design. Unlike other bean-to-cup coffee machines, there are no physical buttons. All settings are accessed via the touchscreen (or the app). This makes the front panel look a lot cleaner and less cluttered, although we think some people might miss physical buttons. There are a variety of drinks to choose from after turning on the touch screen. These include espresso, cappuccino, lattes and long coffees. You can also save your ideal coffee settings and access them from this menu. While the menu is intuitive to use, it takes a couple of button pushes to start making a coffee. The mobile phone app can be a useful feature, although it feels a little more like a gimmick than a genuine reason to buy the coffee machine. You still need to put a cup under the dispenser and you still need to bring the milk container from the fridge - it's not truly "hands-free." Even so, we think the app's main benefit is that it allows you to program your ideal settings on the sofa so they are ready when you next want a coffee. While smartphone integration is a feature that catches the eye, we think the best thing about the PrimaDonna Elite is how much it allows you to customise the taste of your coffee. There are granular settings for coffee dosage, temperature, strength, milk frothiness, grind coarseness and quantity of milk output. While these settings might be overwhelming for a coffee novice, they are a dream for the enthusiast. As you would expect from such a pricey machine, the build quality is also high. With a dual-boiler for quickly heating both coffee and milk and a variety of cleaning features, some serious thought has gone into the design. While the Delonghi PrimaDonna Elite is an expensive model, we feel the advanced customisation features and rich espresso make it worth the money. If you aren't bothered about having a mobile app or such fine control over the coffee, however, then a cheaper model might be just as good. ​Magnifica ESAM 4200.S - This is a maker that can be bought for under £500, yet still has customisation options and a stylish silver design. It also comes with an instant reheat function. Click here to read our full review. Don't be afraid to experiment with the coarseness of the grind - especially when using a new coffee variety. Each type of coffee bean varies in terms of taste and other characteristics, so you'll need to test a few coarseness settings to find the best option. When testing different grind settings, make sure other settings are kept the same. Make sure you buy high-quality fresh coffee beans. Any bean-to-cup coffee machine is limited by the quality of the beans you use - there's no point paying hundreds of pounds for a great machine only to waste it on poor-quality beans! Regularly clean your bean-to-cup coffee machine to make sure it's always in good working condition. Most of the machines on this list have various indicators for when the descaling programme should be run or drip tray emptied - but don't rely on indicators for everything. Set a reminder for cleaning the brewing unit, running the descaling programme and other important maintenance tasks. 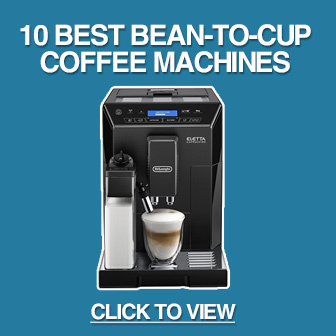 Delonghi bean-to-cup coffee machines are amongst the best in the UK. In fact, three of their models made our list of the 10 best bean-to-cup machines - and there were others that came close. But what makes this brand so popular? For a start, most of their models provide outstanding value for money, with many including features that are usually only found on more expensive models. Delonghi coffee machines also have a reputation for producing excellent espresso and being highly reliable. If we had to choose our favourite Delonghi machine it would be the ECAM44.660.B. The combination of automated cappuccino making, excellent quality espresso and range of customisation features make it our top pick.